Rufus M. Jones, M.A., Litt. D.
"It (George Fox's Journal) is one of the most extraordinary and instructive narratives in the world; which no reader of competent judgment can peruse without revering the virtue of the writer." "The basis of his [George Fox's] teaching was the belief that each soul is in religious matters answerable not to its fellows, but to God alone, without priestly mediation, because the Holy Spirit is immediately present in every soul and is thus a direct cause of illumination. From this central belief flowed two important practical consequences, both essentially modern; one was complete toleration, the other was complete equality of human beings before the law." 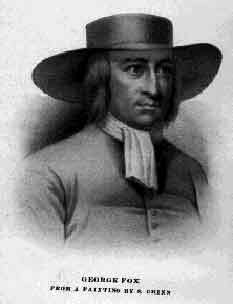 "To sum up in fewest possible words the impression made by his [George Fox's] words and works upon one who studies them across the level of two centuries: he was a man of lion-like courage and adamantine strength of will, absolutely truthful, devoted to the fulfillment of what he believed to be his God-appointed mission, and without any of those side-long looks at worldly promotion and aggrandizement which many sincere leaders of church parties have cast at intervals of their journey." "I have read through the ponderous folio of George Fox. Pray, how may I return it to Mr. Skewell at Ipswich? I fear to send such a treasure by a stagecoach, not that I am afraid of the coachman or the guard READING it, but it might be lost. Can you put me in a way of sending it safely? The kind-hearted owner trusted it to me for six MONTHS; I think I was about as many DAYS in getting through it, and I do not think that I skipped a word of it." - Charles Lamb to Bernard Barton, Fed., 1823. "Fox judged truly that the new Protestant scholasticism had not reached to the heart of things in any image of past experience, or in any printed book however sacred: that academic learning was not in itself an adequate passport to the Christian ministry; that the words of God should not supersede the Word of God. He realized, as few men have ever realized, that we are placed under the dispensation of the Spirit: that the power from on high with which the risen Christ promised to endue His People was no exceptional or transitory gift, but an Eternal Presence, an unfailing spring of energy, answering to new wants and new labours. He felt that the Spirit which had guided the fathers was waiting still to lead forward their children: that He who spoke through men of old was not withdrawn from the world like the gods of Epicurus, but ready in all ages to enter into holy souls and make them friends of God and prophets." - Bishop Brooke Foss Westcott.